Home » New Release » HARMONIX MASTER SOUND will release Second analog record MSA-002. “The Boss” will be available in analog record around November 20. HARMONIX MASTER SOUND will release Second analog record MSA-002. “The Boss” will be available in analog record around November 20. 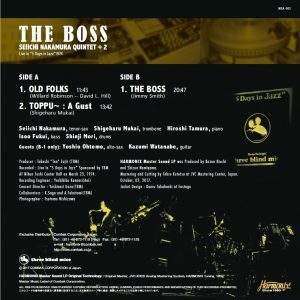 “The BOSS” now back in Analog record MSA-002 the album projected by TBM(Three Blind Mice) for “5 days in Jazz” a live recording in March 23,1974.The album “The BOSS” by Seiichi Nakamura Quintet is no doubt one of five greatest Jazz album TBM ever produced. As you listen, member’s playing technique and performance is extraordinary and unique. It touch your soul and you are really involved! 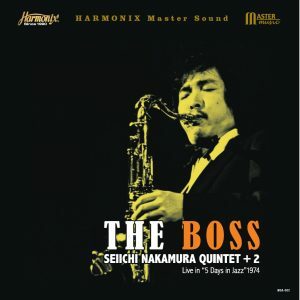 HARMONIX Master Sound now made this Jazz masterpiece “The BOSS” available in analog record MSA-002. It was mastered from original analog tapes and has been made as album you can absolutely thrill the sense of performance Seiichi Nakamura Quintet present.